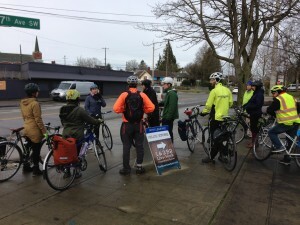 Photos and story by Don Brubeck, West Seattle Bike Connections. Updates by SNG Staff. Doug is a scientist and lover of beer. He lives in Delridge, and he wants a safe and comfortable way to ride with his wife and child to White Center. 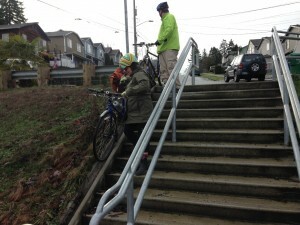 Doug was a pro bike racer, but he is not comfortable riding with his family on Delridge Way. Charmaine is a musician and square dance caller. She lives in White Center and wants to be able to bike with her husband and child to Delridge’s library, parks, and community center. 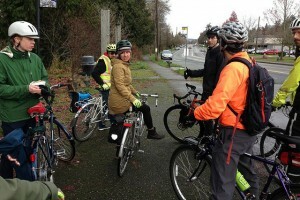 Right now, neither of them has good options, so they organized a ride with other West Seattle Bike Connections members, Gordon Padelford from Seattle Neighborhood Greenways, Cascade Bicycle Club’s Kelsey Mesher, and three SDOT employees to look into improvements. West Seattle Bike Connections’ top priority for 2018 is the Delridge RapidRide H multimodal corridor project. This is the opportunity to make the street safe for people walking and biking, including getting to and from the new RapidRide stops. This is one of the Move Seattle Levy projects that WSBC members worked hard to pass, because of the positive impact it can have for the traditionally underserved neighborhoods of the Delridge Corridor. Delridge is the flattest, most direct route through the valley (the “dell” between the ridges), from the south end at White Center to the north end at the West Seattle Bridge and the Alki and Duwamish Trails. WSBC did scouting rides, discussed issues and mapped routes. With Gordon’s help, we evaluated our possibilities for success and developed strategies. Gordon and Kelsey helped us gain access to SDOT staff for meetings and rides. We reached verbal agreements in principle from SDOT staff to some key requests we made for Delridge, and for spot improvements to the alternate northbound greenway bike route that SDOT has proposed. Our next steps are to build community support, using our members who live on the corridor to make connections. Our challenges include: narrow roadway width along part of the corridor—two blocks with closely spaced driveways that would perforate a protected bike lane, the tendency of some to pit transit versus bikes, and potential removal of car parking on a few blocks. We want to emphasize how biking can support the RapidRide’s less closely-spaced bus stops and the pedestrian safety improvements for crossing busy Delridge, especially at schools. In April, four of our members did a helmet giveaway and fitting at Boren STEM K-8 school, using a Small Sparks grant that Joe and Marlowe Laubach got through the PTSA. WSBC members who are school parents are planning Bike to School activities. We are supporting an after-school bike club project at Puget Ridge Cohousing that Delridge Neighborhoods Development Association’s Willard Brown initiated. We are talking with Willard Brown about other Safe Routes to Schools projects. We moved our monthly meetings to Neighborhood House in High Point, more convenient to the Delridge corridor. After we garner support from the variety of community groups, we will go to our Seattle City Council members and make our case to the public at large. There is a lot more work to do. It will take concentrated effort to build support in time to have an impact on the RapidRide project. But we have members who are willing, and we are up to the challenge. We are grateful for the support and wise counsel that Seattle Neighborhood Greenways staff are giving us. Interested in joining our efforts? Learn more at westseattlebikeconnections.org. 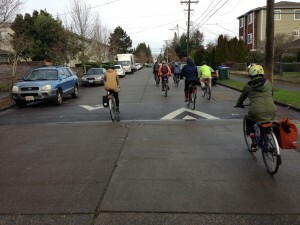 Seattle Neighborhood Greenways collaborated with West Seattle Bike Connections, Seattle Subway, Transportation Choices Coalition, Transit Riders Union, Feet First, and Cascade Bicycle Club to come to a compromise around a design for this corridor. The comprimse design keeps buses moving through the most congested portions of the corridor, provides a southbound protected bike lane on Delridge Way, a northbound bike route on significantly upgraded neighborhood greenways, and improves sidewalks and crosswalks along the corridor. Read our collaborative Delridge multimodal corridor letter. Led by Councilmembers Lisa Herbold, Seattle City Council voted unanimously to continue collaborating with us and community groups to come to a design that improves mobility and safety for all. 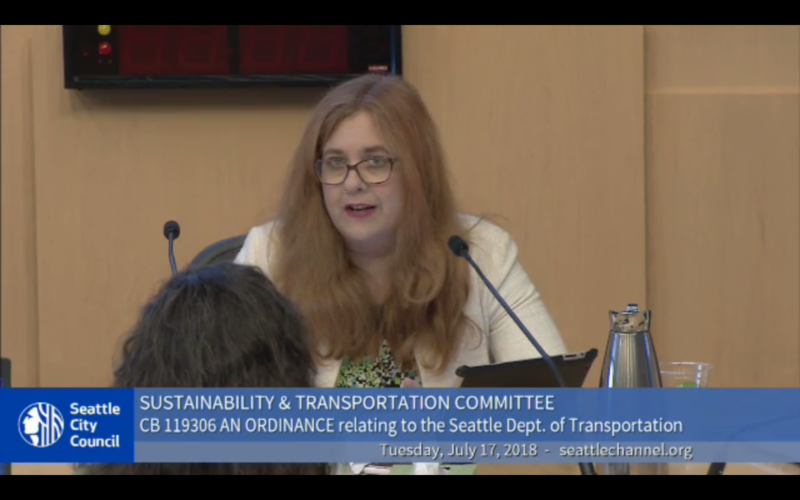 They required (by restricting future funding) SDOT to return to the City Council Transportation Committee with details about investments in the walking and biking compromise outline above as the project moves forward. Thank you to Councilmember Herbold for your leadership on this important project!